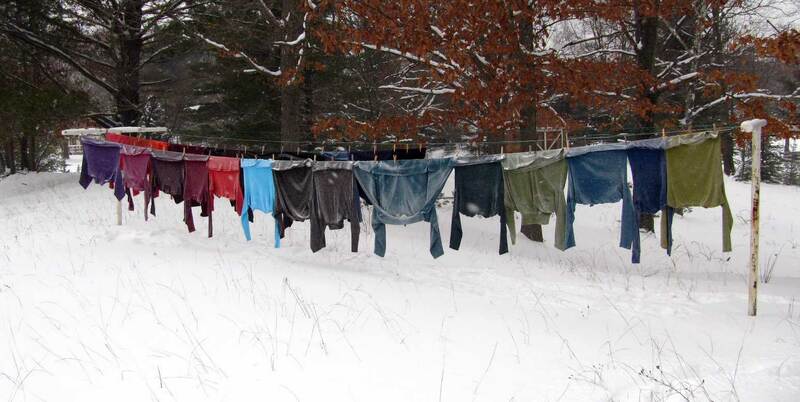 …Hang laundry on the line in a February blizzard. Really there is a purpose to clothes on the line in February: I’m on a mission to remove The Big Stink. I had to quit my job a year ago because the office I worked in was moved to an unhealthy building. Believing that my employer would help me (duh) and well…you know…job, I didn’t quit soon enough and now have a chronic illness that makes it impossible to be out in a world full of synthetic chemicals and poorly maintained and designed HVAC systems without becoming ill. A word of advice: If your work environment is causing health issues for you and your employer doesn’t jump on top of helping you right away, they’re not going to help you. Save yourself. Don’t go to work. Call in sick. Get out now. What you see here is the first steps in an effort to create an income for myself by deconstructing used clothing and reconstructing it into original designs so that I can work from home. Yard sale season is over so this clothing came from Goodwill. Goodwill and most of the big, charitable resale shops spray their clothing with the synthetic chemical concoction that causes so many people health issues: Febreze. It “works” by encapsulating odors. It doesn’t actually remove them so whatever is causing the odor is still there. Plus it doesn’t really work. Whatever it’s sprayed with just smells like heinous, chemical fragrance AND stench. Does anyone even believe in this stuff? Mention the name anywhere and it seems the response is always, “It gives me a headache,” or “It makes me cough.” SIGH. If I leave anything sprayed with it in my home for any period of time, it lays me up for a month (I learned this the hard way.). I’ll spare you the entire list of symptoms, but one involves a burning rash on my face and the skin on my lips peeling off. Yes, it literally burns the skin off of my face. I’ve tried every canary-safe method imaginable to remove this stench from clothing. It’s particularly difficult to get out of wool. Do a Web-search on the topic, and you will find entire threads dedicated to the effort of removing this…er, “stuff” from clothing. The most-touted recommendation is to dispose of the contaminated item entirely. I’ve washed the clothing three times in the washing machine: still stinks to high-Heaven. Washed with Sal Suds, Murphy’s Oil, vinegar: Still stinks. Soak in vinegar, Citrasolv, Murphy’s Oil, dish soap: Still stinks. Dry on high: Still stinks. Wash and hang on the clothesline for a week: Still stinks. Worse yet, it still makes me sick! Once I manage to start to break through the The Big Stink, there’s still the perfume and laundry detergent that the previous owner coated it with to deal with. I’m sure Proctor & Gamble is very pleased that their product is so pervasive…but…for the LOVE OF PETE, please have mercy on the canaries of the world. Hanging the clothing on the line for a week combined with washing in the machine with Sal Suds or Murphy’s Oil (if you can tolerate the pervasive smell of this) is the best method for foiling this evil, stinking beast. I speculated that sunshine and wind might be the key. However, I find the freezing temperatures and precipitation of winter are the best method. I’m now speculating whether or not putting the clothing in the household freezer might work but am not brave enough to try it. After all, one shirt sprayed with this evil stinking beast can contaminate an entire house. I’d hate to have the place I store my food invaded by this, er…product. Here is a list of odor removal methods that are cheaper and actually take the odor away instead of just covering it up with toxic, synthetic chemicals. Essential oils in water (and/or vinegar) in a spray bottle. My favorite smell is lavender, but tea tree, lemon, orange and Thieves are also good choices. You can blend these to make your own fragrance. If you’re trying to decontaminate something, I think Thieves would be the best choice. Note: Some sensitive people are made sick by the VOCs in essential oils so don’t get crazy with spreading smells all over the place. Smells Begone. An enzymatic odor eliminator with no added fragrance. Wash it with water and a safer soap like Sal Suds. Water is the most powerful solvent on Earth! Go water!! To learn more about what common products are safe (or unsafe), visit the EWG website. Unfortunately they only analyze the individual chemicals. They don’t analyze the toxicity of the chemicals combined. Many products have over a hundred synthetic chemicals in them. Regulations are slim or non-existent and the manufacturers don’t have to tell you what is in their products. This entry was posted in Canary, Clothing, Environmental Sensitivities, Health and tagged Canary, Environmental Sensitivities, fabric, health, I Hate Febreze, Multiple Chemical Sensitivities, Odors, Removing Febreze, Toxic Household Products, winter, Work in Progress. Bookmark the permalink. The odd thing about Febreeze is that initially, it had no perfume – at all. I found this out on Public Radio- the show was about something else but this surfaced as a small fact. I think I remember this, Mark. I never cared much for it, being a HUGE fan of Smells Begone, but it became intolerable when they added perfumes to it. Gross. Hmmm, very interesting. Not having a fragrance wouldn’t necessarily prevent it from triggering symptoms in a sensitive person but it must have been at least a little safer. I have used baking soda & water to remove smells from laundry. My husband wears POLO shirts to work, and has about 30 of the same brand, all made in different parts of the world. He continually complains about the SMELL in the collar of all of his RED polo shirts. Must be the dye reacting to his body oils; but no amount of washing products helped. So; I mixed up about 1 cup baking soda in a bucket of warm water to disolve; put the shirt in the bucket and stired it a couple of times daily for 2 or 3 days. Dumped the bucket full of baking soda water with shirt into the washing machine, washed with normal detergent and VICTORY….the funky sour smell in the coller is GONE. So; if the Blizzard doesn’t work…try baking soda. I know the warehouse store near us (B.J.’s) sells it in 5 # BAGS….but start with the little box in the kitchen cupboard which is generally about 8-12 oz. Oh, yes. I forgot about the baking soda. Thanks for the tips. I should have added it to my de-deodorizer list. It’s also one of my main cleaning products in the home. I make my own laundry detergent and it has baking soda in it. I’ve tried the baking soda soak with the Febreze and it doesn’t work. I’ve even tried a baking soda/vinegar soak. It definitely helps though. Congratulations on solving the red dye mystery and thanks again for the tips. I wouldn’t suggest using both baking soda and vinegar together. Have read multiple sites and they seem to cancel each other out. I would use vinegar wash first. Then follow with a second, separate baking soda wash.
Hi Elisabeth, I honestly considered requesting that you edit your comment to not include advertising for yourself and your product but decided that people with MCS need as many resources for healing themselves as possible: What works for one person might not work for another. I’d have felt better about it if you’d asked if you could advertise yourself first. Just a suggestion…. I’ve met a lot of MCS survivors in the months since this post. Most of them have been able to heal themselves enough to function in the world and do the things you’ve listed but none are 100% cured. I myself am now under the care of an Environmental Illness doctor and well on my healing way. While I’ve taken steps to stop the self-defeating loop between my amygdala and my conscious brain and worked on my overall body health with eating and exercise, the thing that has helped me the most is regular visits to a biometric feedback practitioner at the Downing Clinic in Clarkston, MI. My first visit brought immediate relief from symptoms that included holistic inflammation, insomnia and depression. Also essential is getting a team of friends and family who are on-board, understanding, healing and supportive and avoiding anyone who is not willing to be a healing advocate. Onward and upward. I’m happy to hear you have improved as well. Feel free to remove my links if you like. My goal is to give people hope that more is possible. Yes! I think complete self-healing is absolutely possible and giving people hope that it is possible is essential. So…your link stays and hopefully someone will find the help they need to move forward with their healing. I am a canary also. All of my new clothes have been sprayed with something very smelly. After washing, soaking in vinegar and all the above mentioned things, I put the clean garment in a gallon ziplock bag and put it in the freezer for at least a week. It may take longer. The smell is usually gone after all that. Thanks for the tip! I am healing and fortunately not as sensitive as many canaries. Better every day. Yes, new clothes are awful too, but easier than second-hand for me. I just need to wash them about three times. Glad you’ve found a solution, albeit a bit tedious. Do you put the clean garment in the ziplock in the freezer wet or dry? I place the garment in the freezer bag dry. Why buy clothes that smell so bad that it takes extensive work to de-stink them? If the point is to save money, I do that by buying clearance clothing. The cost is roughly the same, and I’m not wearing someone else’s smelly rejects. Hi Alex, because all clothing whether new or used is full of synthetic chemicals that affect those with multiple chemical sensitivities. It takes several washings for any clothing a canary receives. For some canaries, new clothing is even worse. Also the purpose isn’t only to save money. One of the purposes–and there are many more–of buying used clothing is to offset the purchasing of clothing made by people who are not paid a living wage and work in dangerous conditions. I’m so glad I found this post. I knew about the spoon theory but now I know I’m also a canary. It feels so good to know I’m not alone. Well, I’ve learned something new too. I had to Google the Spoon Theory. At least 15% and up to 30% of the population is affected by synthetic chemicals in their environment. You’re definitely not alone. You could try soaking your clothes in Washing Soda. I wouldn’t be without it. It removes dirt, odors, stains and soap. I use it to clean our doonas and they come out so white they look new. I use it to soak my dish cloths and it removes any soap. Have even used it with Enjo cloths. PS:- You must keep it below 30 degrees or it will melt. I keep mine in a small bucket with lid, in the fridge. We have also used it in the dishwasher and it is perfectly safe. Thanks! I make my own laundry detergent using washing soda. Wonderful stuff. I can’t now remember if I’ve tried soaking things in straight washing soda or not. Seems likely that I have but will try again. There’s usually so much detergent already trapped in used clothing, I just send clothes through the washer without detergent the first couple of times. Vinegar helps with the rinsing but not much. I’ll experiment with the washing soda. Thanks for the tip on storage. 30C is 86F for those of us here in the States. Hi. I was so glad to see I am not alone with this issue. And I do much the same as you with buying used and selling, but the Febreze and other scents are difficult to be around. People have belittled my problem, and written it off to me complaining. Walking into many stores is almost impossible…bed, bath and beyond….the laundry and room freshener aisle at target….pier 1. The list goes on. I am going to use your ideas and any other references to rid myself of this awful syndrome. I’m sorry that you have this. You’re definitely not alone. I’ve been actively working on healing my immune system injury since 2013 and getting slowly but surely better. Avoidance is key. All the best to you. Oh, wow! That’s terrible. I’m sorry that you and your husband had to go through that. Allergies are different than Multiple Chemical Sensitivities so it’s hard say whether or not the Green Soap would be okay until I see the ingredients list. Do you have a link to the product that you’d be willing to share? If it happened to be something us MCSers could use, we’d be eternally grateful. Thank you and thank you for your comment. Car Dealers spray God knows what in Cars, So this is my letter to them . I have been a customer of Carbone Nissan starting in 2010 after moving back to my home town of Clark Mills , NY to hopefully heal and retire from a disabling illness . I was driving a 1996 Nissan Quest for 15 years. I would have got another vehicle before this time , but because of my sensitivities to chemicals I just kept putting money into the old Quest, always when I was approached or called by sales people about buying a newer car, I would just say ,Thank you, but I can’t at this time, maybe in the future. This was easier then trying to explain an illness that most people don’t know about and couldn’t fathom having . After having someone clean my chimney in my Virginia Beach Home , I woke up so sick I could not live in my beautiful home of 15 years and had to sell it along with 90% of everything in it. I ended up living ( outside ) at a friends house until my house sold ,then 2 weeks later I moved here to upstate ,NY where my relatives live . Carbone Nissan service department employees ( Howard Edel ) and car mechanic ( Carrol ) always made sure not to expose the interior to anything . Always showing me compassion for my illness . After living here for 6 years and trying to stay away from everything that made me ill , I was not so sick . My quest was getting to the point where It needed too much work and I felt I had no choice but to find another vehicle . I came in on Friday August 5th 2016 and talked to Joe Curri. He showed me a 2010 Kia Sedona and told me that , this was the only vehicle they had in my price range .I just looked in it ,I didn’t drive it . ( I explained my illness in detail ). Joe asked me how did I get sick ? I told him how it happened . I said I like the van and would be back. I came back on Saturday August 6th 2016 and did a test drive . I was ok driving it and didn’t feel sick , so I said I would like to buy it . He set it up for me to buy the van Monday August 8th 2016 at 2:00 . I told him I didn’t want anything done to the van , no cleaning, nothing because of my illness, he said Ok , I understand . Joe called me at 1:30 to ask me to wait a while longer to pick up the Van because they were cleaning it, I loudly said ( WHAT , Joe I told you that would make me very ill . He said hold on I will check what’s going on. When he got back to me , he said they only cleaned the outside . I picked up the Van and drove it home, I noticed a sent but tried to ignore it , thinking it was because of the outside being cleaned. I woke up the next morning sick , by August 10th 2016 after only driving it 2 times for only 30 minutes I was very sick .I took it back and dropped off the keys and came home where I could breath and wait for a call from Joe or someone. Shortly after I came home Joe brought the Van back to me , saying they have to park it here because they have no room on the lot of it. I talked it over with Joe, He said he would talk to his manager and get back to me . No calls from Joe or any manager , I couldn’t drive the car so on August 12th my sister Kathy Jodlowsky , who has just bought a 2016 Van from Carbone came and got me to find out what can be done about this problem . We spoke outside to Clayton Lonis where I could breath better . I wanted my Van back and couldn’t keep the 2010 Kia Sedona because of the strong smells from detailing the interior. I explained to Clayton Lonis, For me this is life threatening because once the sense of smell is damaged I would only be able to live outside . I don’t need to tell you that A New York winter would kill me . My sister spoke up and said Carbone prides it’s self on helping the handicap , she herself has a daughter with cerebral palsy . She said , Can’t you steam clean the upholstery and clean off dash and door panels with just water . He said he didn’t want to put anymore money into the Van . He just stood there saying nothing with his sun glasses covering his eyes . I said, please , you have to make this right. He said they would clean the inside with water and run a ozone machine overnight in it . They came and got the van Friday afternoon August 12th and returned it Monday August 15th. I have been working on airing the van out , I can’t drive it, It makes me sick just opening the windows . I don’t know if I will ever be able to drive it . So now I am STRANDED here in the country, I live by myself, everyone and everything is far away . I will be paying for a Van and Insurance that I can’t even drive . I know nothing about selling a car, I can’t get into it for someone to test drive it. And I know I would have to sell it for less then I bought it for and still have a payment to make and I can’t afford 2 car payments. I am as sick as I was when I arrived 6 years ago, I’s been a long road, and now I am right back where I started, only now I don’t have a vehicle I can drive . It has been hard enough to lose my home and almost everything in it , leave my friends , my daughter Shawnee and granddaughter Katie who I watched everyday , I really can’t take being stranded without a vehicle , no way to get to Doctors. Wow! Cynthia, I am so sorry! What a terrible situation! It’s such a familiar story in the MCS community. I hope one day to be well enough and have enough money to help people like us. There are some very supportive groups on Facebook. Not much physical help because we’re all so scattered across the country and world but lots of emotional help. Let me know if you need the names of these groups. In particular you might check with the People Rescue group and the MCS Mapping Project. Maybe there’s someone nearby that can help deperfumigate your vehicle more quickly. In the other groups you’ll also find pointers on getting those poisons out of your car more quickly and I’m happy to tell you my process but you would need to find someone to do it for you as it involves being in the car to clean it. You’re welcome. Unfortunately your story is way too familiar. Unfortunately this kind of thing happens to us all of the time. Definitely find the groups. They’re very supportive and have lots of tips and tricks for dealing with life with MCS. What a blessing that your family is willing to help you. If you can, have them do all of the cleaning on the car. There are a few different ways to deal with the fragrance in the car. All of us are different so you’ll have to figure out what you can and cannot tolerate. This is how I would deal with it. I would leave it outside in (hopefully) fresh air with doors and windows open. Sun helps. Freezing temps help. Before you clean it, it might be a good idea to run the AC/heat with fan on high to help get the odors out of that system. Leave the doors and windows open when you do this. Some people have sprayed Concrobium in vents to get rid of mold or fragrance sprayed in the air ducts. Vacuum with a HEPA filter vacuum. I’d then scrub every surface I could reach with soap (like Dr Bronners or Ecover dish soap) and water that you can tolerate. Wipe with fresh, clean water. Wipe down everything with white vinegar. Wipe down everything with vodka. Make sure you can tolerate the white vinegar and vodka first. Apple cider vinegar or lemon juice would be fine too. Sprinkle baking soda on everything. Maybe make a paste so it sticks to the roof liner and such. Let it set for a day or two. Leave the doors and windows open if you can. Vacuum. I’d then close it up and use an ozone machine if you have one. Ozone is controversial so do what you think is best. Turn off the ozone machine after a few hours and open the car up outside. Vacuum. Run an air purifier in the car (but not the one you use in your house or it will be perfumigated too). Run through the same process again: lightly soapy water, vinegar, vodka, baking soda, vacuum. If you can tolerate a Thieves oil type essential oil blend, I feel like that helps with de-perfumigation too, but not all of us can tolerate essential oils. Also be choosy about the brand of essential oil you use. Many of them are processed with synthetic chemicals. Leave a pan/bowl of baking soda in the car at all times. Activated charcoal and zeolite are other things that soak up odors. Wash the outside of the car too because the fragrance is now stuck to everything. One thorough wash ought to take care of the outside. Good luck! This might be a long process that you have to repeat over and over but you’ll notice a slight improvement each time. I over sprayed a closet with Febreze, now I can’t get the Febreze smell gone. It’s horrible nightmare, my whole Apartment stinks badly from the Febreze. I have tried, washing walls, baking soda, charcoal, vinegar water, nothing helps it comes back stronger. I also tried two different odor remover sponges, between the Febreze an odor remover sponges the chemical mix chased me out of my home. Phew, I’m so sorry this happened! Fatalbreze is one of the toughest, synthetic chemicals to remove. Total Kryptonite for those of us with chemical sensitivities. Sounds like you’ve tried just about everything. I’d keep repeating the process. I know how frustrating and energy/time-consuming this process is. I’d suggest trying vodka (or rubbing alcohol if you tolerate it) but since it’s been painted over that might not work. A repeated paste of baking soda wiped on and left to dry and then washed off might help. You might try Concrobium. The active ingredients in it are TSP and washing soda, and you can get it in the mold treatment area of a hardware store. Spray it on. Let it dry. Wash it off. Repeat. I’m not sure what kind of soap you’re using but fragrance free (or you’ll be adding more scent) dish soap might be your best bet. Dr. Bronner’s Sal Suds or AFM Safecoats general cleaning soap work well sometimes too. But, since washing isn’t helping and you’ve already painted over it, we might need to look elsewhere for a solution. If you have an air purifier, run that non-stop. You’ll probably have to replace the filters because they will probably smell of Fatalbreze forever more too. Another solution is to seal the closet off and never use it again. Metal foil tape is good for sealing the door up. Use painter’s tape (if you don’t react to that) under the foil tape so the paint doesn’t get damaged. Not sure what you used to seal in the odor but AFM Safecoat makes a coating for this purpose. YOu might find some others at ECOS Paint. Bioshield paint might have something too as some sensitive people don’t tolerate the AFM products. Green Building Supply might have some other suggestions and are very good at answering questions. Alternatively, you could get some wheat paste and “wallpaper” the walls with tinfoil. Yup, tinfoil. It’s great for blocking odors. There’s a product for this purpose called Denny foil but it’s not as readily available and more expensive…since you’re doing experimental troubleshooting. An ozone machine might help but you have to be careful with them too. Seal the room off and don’t go in while it’s running. Keep pets out of the room too. Run it a couple hours at a time with the windows shut. Have someone who isn’t sensitive go into the room to open the windows so the room can air out for a couple hours before you try to use it again. If you have an air purifier, turn it off while the ozone machine is running. Turn it back on when you air out the room. You can also keep bowls of things that absorb odors in the closet. Baking soda, coffee grounds, salt, activated charcoal, zeolite all absorb odors. They all air out pretty well and can be reused if you put them outside. Sunlight helps. Freezing temps help (obviously this doesn’t help you but…). Turning up the heat sometimes helps. It’s a ridiculous amount of work to overcome this issue and you’ll have to count your successes incrementally. Every little thing you do should help a little bit. It’d be great too if you shot an email or letter over to the makers of Fatalbreze asking them how to remove their product. I don’t think they’ll be helpful but, if enough of us complain about it, maybe they’ll make a nice, safe antidote some day. For future freshening white vinegar or an enzymatic spray like Smells Begone (fragrance free option) or BioKleen (it has a citrus scent) work pretty well. I used equal parts rubbing alcohol (vodka is said to work also) and hot water, a TBSP of Dawn and 1 TBSP of vinegar with an upholstery cleaner to remove perfume febreeze smell. It’s the best solution thus far. Thanks, Shannon! That’s great news. I’ll have to give that a try. I’d definitely have to replace the isopropyl with vodka and I can’t use the Dawn either. The fragrance chemicals and some other synthetic ingredients (phenoxyethynol) slay me. It’s actually worse than the isopropyl for me. Hopefully it would work with a safer dish detergent like Seventh Generation or Ecover. Do you mind sharing the brand and model of the upholstery cleaner you used? Thanks again for the tip and thanks for commenting! Help. My husband just went to Goodwill and came home with a wool suit, still in the car, that still had the dry cleaning tags on it. Why the store employees had to then spray it with toxic Febreze boggles my mind. I hate Febreze so much and never buy anything at thrift stores that I cannot wash at least 3 times before airing them outside. Will dry cleaning remove this heinous smell? I’m already getting sick and I smelled the suit outside in the wind. I doubt that a $50.00 dry cleaning will do anything but I need proof. Dry cleaning won’t help and, if you’re chemically sensitive, it will probably make your reactions worse. I’ve had luck washing suits by hand and airing out outside, but it’ll never be “crisp” again. You might also try putting it in a box full of baking soda. It’ll take a long time to air this suit out. Thank you, Rebecca. The suit is going back to Goodwill. I share your distaste for The Big Stink. I have chemical sensitivities and can’t tolerate fragrances or mold. Best thing I’ve found is DF-200 or Easy-Decon (comes in 2 parts; a gallon of each) available from justfogit.com or Midwest Chemicals. To use it on Good Will stink, you will need a top-loading washing machine. Put stinky items in washer. For a full load, prepare 2 cups of DF-200 in a 2 cup Pyrex in this way: Mix 1 c of Part 1 and 1 c of Part 2. Stir and wait 2 minutes. Add a teaspoon or two of the enhancer, stir and wait 1-2 min. Start filling the washer with water. Pour the solution on clothes and rinse the Pyrex cup with water that’s filling the washer. There will be a chemical smell that will dissipate in a few days. There is NO fragrance at all in this product. Its job is to neutralize VOCs, and it does this superbly by using soap and hydrogen peroxide. Back to the washer…. After it fills, let it agitate for 3-5 min. Then stop it and let the clothes soak for 2 hours. Then finish the cycle and put in dryer or hang on line. There may be a residual smell for a few days, but it is NOT fragrance and it is not toxic. We bought the $600 cold fogger kit from justfogit.com to neutralize mold and mycotoxins. I experimented with the solutions with stinky laundry, and this is what works best. For items too big for your washer, go to a laundromat with your 2 cups of solution mixed up and add it to the wash cycle like detergent. No need to use any laundry detergent with it. Even though you can’t get a 2 hour soak time, you will still be able to redeem most items. Throw them in the laundromat dryer. Don’t be alarmed by any strange smell. It will dissipate in a few days and is non-toxic. I hope this helps. It has saved my sanity. Now to figure out how to Febreze off a sofa. Permanent oil-based stink. It should be illegal. Thanks for the tips. I agree. Fatalbreze is really toxic. If only people would do the research….I’ll check out the product you mentions.